Our family vacation in the woods was intended to be sandwiched between two (yes, two!) adult date nights. Both required clothes other than those I wear to the beach (what? huh? a bathing suit over my wrap around vintage skirt won't work for your black tie wedding? Hmph). It's a challenge I rose to with the help of (a visit to my girlfriend's closet and...) once again - Amy's Bend-the-Rules clutch. Is it possible to have a clutch for all seasons and all outfits? Perhaps that isn't necessary, but I appear to be headed that way anyway. First up - the afternoon wedding clutch. I snuck into (can you 'sneak' on yourself? Hmn.) my to-be-saved-for-future-recovering-efforts stash of the yummy Joel Dewberry, and lined it with brown and cream polka dots, because polka dots are where it's at (says I, who knows nothing about where 'it's' really at). The clutch worked great - the wedding was lovely, reception fun, and much dancing ensued. (And the babes had a great time with Grammie and Grampie, staying up hours past bedtime, which what you're supposed to do when Mama and Papa aren't around.) Good times, on Date A. 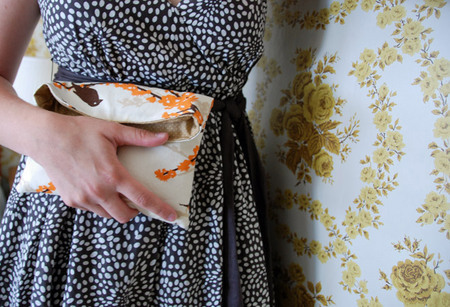 And then, clutch #2 for Date B, with one of my favorite vintage fabric finds ever (I know, I say that a lot). Sadly, though, this clutch did not see it's proper due. Date B - our first overnight getaway sans kids in a ridiculously long time (in other words: six and a half years! ), - was canceled. What are the chances that our usually-very-healthy family would all be so sick on the morning before our much anticipated (by us and our babes) solo overnight? Hmnn...I suspect a conspiracy. This shot has nothing to do with anything, really, except I was actually holding the clutch and attempting a shot of it. My new camera is a little heavy for my classic arms-outstretched-self-portrait - as charming as those may be (ahem) - so this is what I get most of the time now - a total miss. But that wallpaper? That's what I want to show you. Isn't it fab? It's in my mother-in-law's house and I love it so (she is so going to laugh at me when she sees this photo here, Hi Judy!). I kind of want to wrap myself up in it. 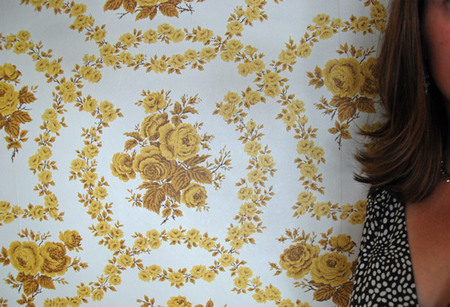 No, really if you could wrap up in wallpaper, I'd pick this one. Clearly, I need to get out more. I'm trying, but as you now know - date night is jinxed. It's a very good thing I love cozying up with those little ones so much. I really do.